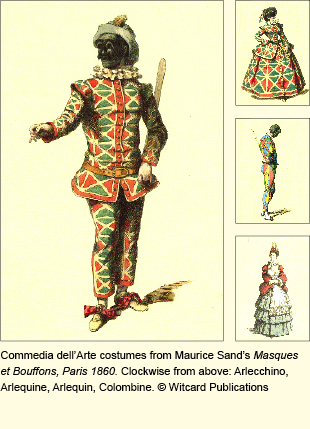 The character of Harlequin – or ‘Arlecchino’ – originated in the Commedia dell’arte, the improvised theatre of 16th-century Italy. He was a wily and unscrupulous servant whose clothes were covered in patches. His face was covered with a black half-mask which also had a bushy moustache and whiskery beard. Through the centuries, Harlequin’s costume became increasingly stylised, and the tatty patches became a regular diamond pattern. The plays involved a great deal of physical humour and this aspect of the characters was carried through to the British counterparts of the 18th and 19th centuries. An actor playing Harlequin had to be an acrobat as well as an actor. Some of the famous Harlequins of the past, such as Tom Ellar, did themselves permanent physical damage from playing the part. Another attribute of Harlequin is his ability to do magic. The French version of the character could turn himself into different people. The English Harlequin of early pantomime could transform the things around him by hitting them with his magic bat or ‘slapstick’.